I immediately seized upon the relationship between the capabilities that Fisher described to me and the needs of my doctoral thesis on the perceptual geography of central Boston. With Fisher as my tutor, I gave SYMAP its first applied test. I was trying to explain why some parts of central Boston were included in Kevin Lynch's book Image of the City and some were not. I acquired data and mapped and analyzed it (figure 2), including via a graphic spreadsheet-type program, which I had to invent. 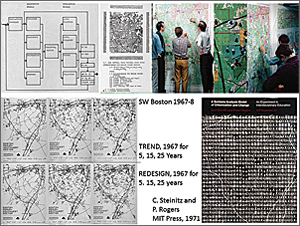 Partly because of this work, I obtained my first appointment at the Harvard University Graduate School of Design in 1965 as an assistant research professor and as an initial appointee to the then-new Laboratory for Computer Graphics. 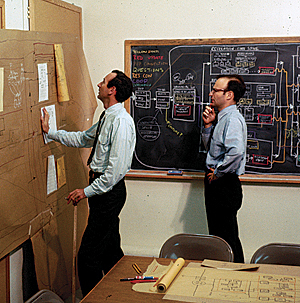 The Laboratory for Computer Graphics was established in 1965 with a grant of $294,000 from the Ford Foundation's Department of Public Affairs and various smaller contributions from and to the Graduate School of Design. 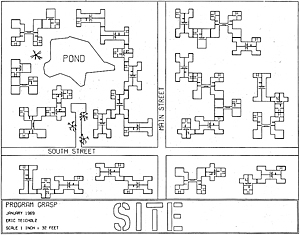 Under Fisher's direction, the laboratory assembled a group of bright, energetic, and experiment-minded people, including urban planner Allan Schmidt, water engineer and economist Peter Rogers, and architect Allen Bernholtz. 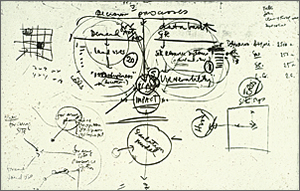 The laboratory's research was basically of two types. The first was investigation into the analysis and computer-graphic representation of spatially and temporally distributed data and was built largely upon Fisher's SYMAP, which became in its time the world's most widely used computer mapping program. In a very short time, we developed several innovative methods of high-speed electronic digital computer mapping and new techniques for data analysis and graphic display. These made full and efficient use of the accuracy, speed, and cost of the computers of the time. Yet even in this first study, some rather sophisticated analytic steps were undertaken. These included a gravity model; various terrain-related analyses; the effect of one map pattern on another; and overlain data maps combined via quantitatively weighted indexes, such as the relative attractiveness for vegetable or grain agriculture. I cannot overstate the importance of the initial academic decision of Charles Harris, then chairman of the Department of Landscape Architecture, to support me to introduce GIS-based computing in a design-oriented studio rather than in a specialized "technical/computer" course. This would prove crucial to the future development of GIS at Harvard as a set of methods for design. 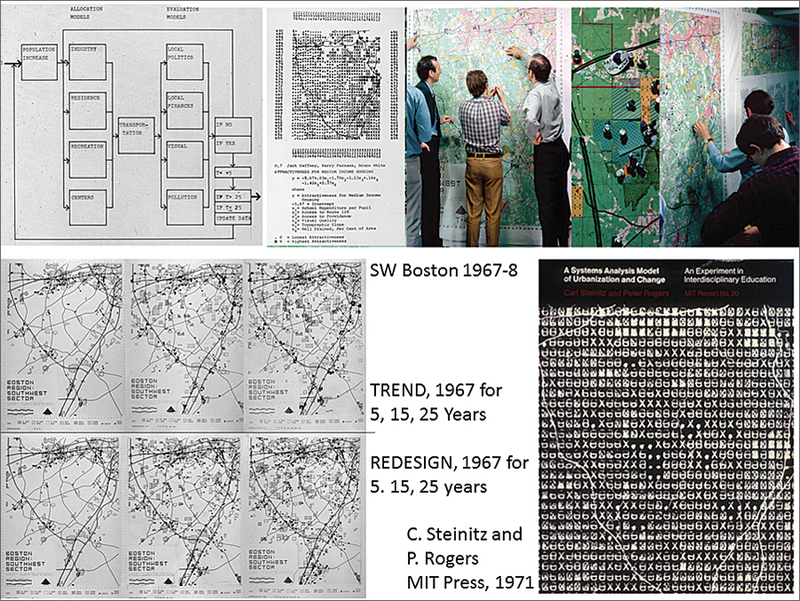 In 1967, Rogers and I organized and taught an experimental multidisciplinary studio on the future of the southwestern sector of the Boston metropolitan region. The intent was to model the often-seen conflicts between the environmental vulnerability of the regional landscape and its attractiveness for development. We were also making a regional design for better managing the region's sprawling urban expansion. 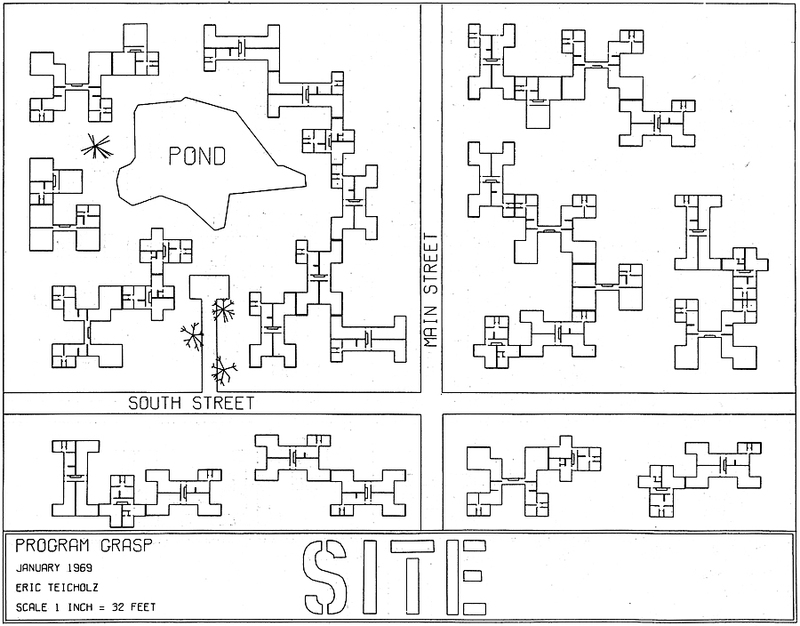 My initial diagram for this study was made in early 1967 and is shown in figure 5. Note that it begins with an understanding of decision processes. It distinguishes between land-use demands and evaluations of their locational attractiveness and site resources and evaluations of their vulnerabilities. It assesses risk and impacts and proposes generating plans with the rules of a simulation model. It is organized in the same sequence now outlined in the second iteration of the framework in my 2012 book A Framework for Geodesign (although we didn't call our work that at that time). 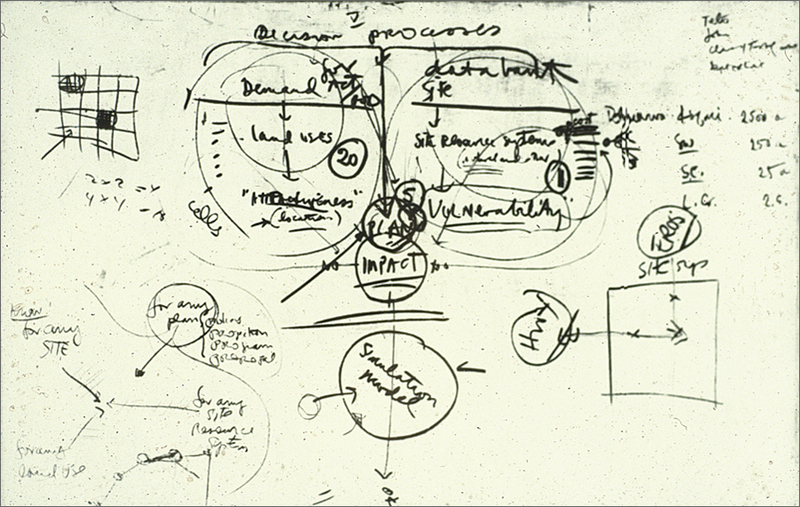 The entire flow of information for the study was designed by Rogers and me before any "work" was begun (figure 6). The study area was a rapidly changing suburban area. There was no digital data, so the students organized a GIS from air photo interpretation based on a 1-kilometer grid. (Remember, this was 1967.) Our students were also involved in all phases of the detailed specification, implementation, and uses of the models. The students then assessed the consequences of the trend changes with the several impact models. These impacts were visualized by overlaying colored pins and notes on the causal changes. The students then interpreted the impacts and decided whether changes in the trend's land-use pattern of any stage were required. Lastly, they re-allocated the changes by design, producing results measured to be environmentally superior and meeting the criteria for development (figure 7). 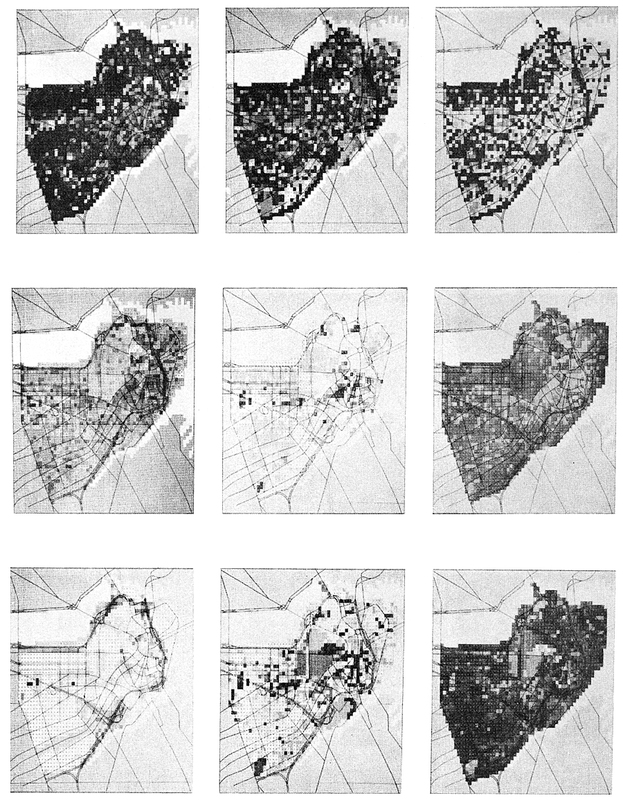 This Boston study was published in 1970 as A Systems Analysis Model of Urbanization and Change: An Experiment in Interdisciplinary Education (MIT Press). 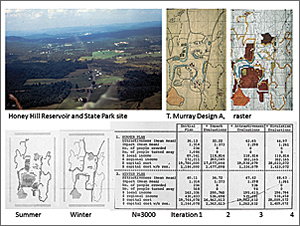 Also in 1967, our research group, which included landscape architects Richard Toth, Tim Murray, and Douglas Way and engineer-economist Rogers, began a series of GIS-based studies that related various ways of making and comparing designs for large and environmentally vulnerable geographic areas with complicated programmatic needs. The Honey Hill study, named after its location in New Hampshire, was sponsored by the US Army Corps of Engineers. It involved a large proposed flood control reservoir and a new state park. GIS-based evaluation models were made of the attractiveness of this large area for recreation and other uses and of the vulnerability of the site's natural systems to harmful impacts. 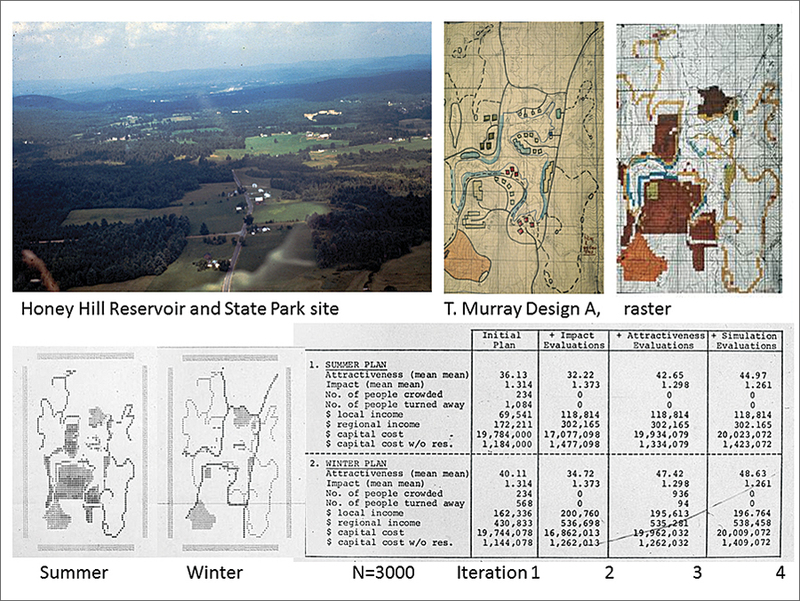 Each member of the research team then proposed a design for the new lake and park facilities, in summer and winter (figure 8). 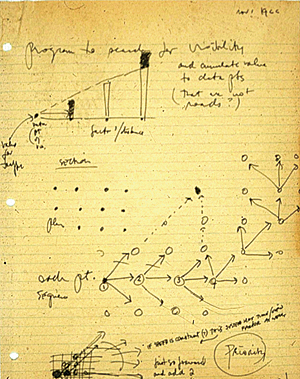 In addition, Rogers used a linear programming algorithm to produce a fiscally optimal plan. These alternatives were all compared in yet another model, which simulated several levels of population demand and user movement to the area's facilities based on varied assumptions regarding number of persons and patterns of activity preference. Overcrowding and movement to second-choice locations or activities and capital and maintenance costs for the design alternatives were among the comparative impacts. Each design went through three iterations of assessment and redesign. The optimizing program performed best, and my design came in fourth. 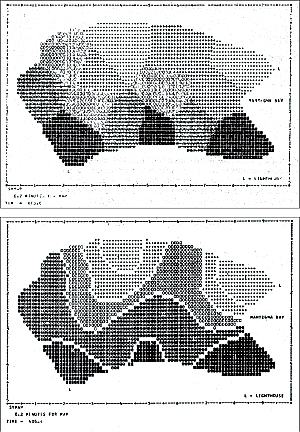 The Harvard Laboratory for Computer Graphics and Spatial Analysis ceased to exist—for many complex reasons—in 1981. By then, 165 people had served on the laboratory staff at one time or another. 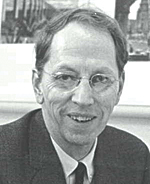 Much of the credit for the lab's diverse accomplishments should go to Fisher, who died in 1974 and who was a remarkable person of uncommon energy and foresight. The many individuals linked to the lab and their ideas, computer programs, demonstrations, publications, and especially students were significant contributors to the development of today's GIS and many of its applications, including geodesign.